52 Weeks of Organizing was a series I ran each week in 2011. I’m leaving it up and accessible for anyone wanting to follow along at their own pace in the future. All the posts related to this series are listed below for your convenience. I’d like to challenge you to create a list of 52 organizing projects or habits that need to be done or developed around your home…dressers, drawers, closet, toys, paper, you name it. Having a plan is a great first step! Tackle one a week or more. Looking for a place to start? 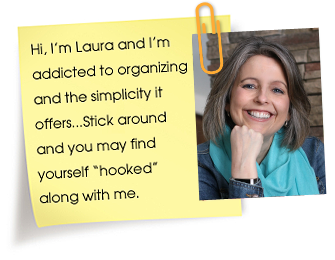 My book has 101 organizing tips in it giving you plenty of projects to pick and choose from. Even if you only accomplish 52 of them this year you’ll be well on your way to living an organized life in no time. If you’d like I’ve created a simple sheet to help you keep track of your 52 projects. Keeping track of your accomplishments will motivate you to continue but remember don’t go crazy and put down “organize office” as one project. Try breaking it down into manageable bite size steps instead, listing them all separately. One shelf, drawer, closet, surface space at a time (unless of course you are feeling really motivated than by all means fly at it!) Click on the link below to print your copy. Week #1 Where will you start? Week #5 Why do you want to get organized? Week #9 What is your good enough? Week #14 Does your system need a change? Week #22 What’s the Big Deal about Labels? Week #26 How Much is Enough? Week #31 What Does Simplify Mean to You? Week #38 Put It Back! While some of the weeks above provide practical organizing tasks, the majority of the tasks were intentionally created to teach basic organizing skills. So as a supplement to this first list, I’ve created a second list of 52 Weeks of Organizing Tasks that lists a practical task for each week to help you get your home in order over the course of an entire year. Click the link below to download. 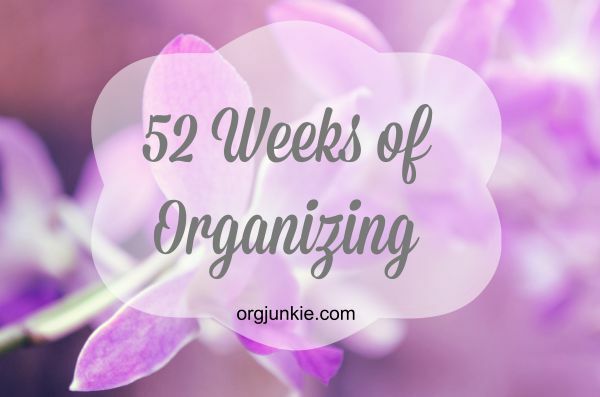 Download the 52 Weeks of Organizing Tasks here. Keep me posted as to how you make out! I just started this with my blog and I wanted to let you know that I talked about this wonderful blog and the 52 weeks project. I hope you don’t mind! Hi… I just found your blog and love it! My New Year’s resolution ties in perfectly to your 52 weeks project and I am super excited to get started. I tried to download the projects pdf file, but it’s not working for me. Any suggestions? Look forward to working together to make some much needed changes for me. Was able to download the nice 52 weeks of Organizing list. Thanks! It is never to late to get started with some thing like this 52 weeks of getting organized. I am so down with it, that I blogged about my commitment. I am making my list. Have a something to brag about on Friday. Looking forward to cleaning out the clutter. Thanks for the inspirations and wonderful hints on getting it done. Nope never to late to join us here! Looking forward to seeing your accomplishments!! Hi Laura! Just accidentally found your blog and it is awesome! I love the idea of a 52 week plan! Can’t wait to get started… I have a LOT of work to do. I just wrote about one of the baby steps I’ve recently taken on the path to Clutter Rehab (great title, by the way!). Check it out! So glad I found you. I’ll be back! Hey! Was out of town…but still keeping up with my organizing goals! This week I tackled the fridge…inside and out. I moved all the photos off of the front and placed them on the side so when we walk in the door…we see all the fun stuff we’ve done recently. I got two small, magnetic dry erase boards (with a magnetic marker) and put it on the front of the fridge. One is for my husband and I to write messages to each other and the second one is for me to write the little “to-do’s” that pop into my head that I want to handle in the next day or two. On the inside of the fridge I went through and tossed all expired items. Then I gave everything a good cleaning. I got some small plastic bins to store meats, cheeses, fruits, veggies. Our fridge just has one giant drawer on the bottom instead of a few smaller ones. So…all our stuff ends up getting tossed in there and we forget what we have cause we can’t see it all! Well…we no longer have that problem…the bins are working out well. They are actually plastic shoe boxes for storage, but three of them fit well in that drawer and others can fit on the shelves above. Wow Laura. Your site is just what I need. In a few months we are moving to a small place and I need to severely downsize our belongings. I am very excited to start decluttering. My house is too full and with 4 kids there is always more stuff coming in than going out. I hope I can get everything done in time. Hi, Laura. I thought I was highly organized…until I found you. I am so encouraged by your site here. I am going to start linking up my organizing and decluttering posts here. I am on a canvas bin mission right now 🙂 Thank you so much for encouraging me through your site. I hope I can help others, too. Have a wonderful day!